I have two friends embarking on cooking their very first Thanksgiving meal and both asked me for my mashed potato recipe this week. Um. I don't have a "recipe" per se; I just eyeball the technique I see my sister, Amy, use. By her own admission, Amy's not much of a cook, but her potatoes are not only easy, but divine. There are a few unusual tips, but nothing complicated so anyone can be successful with this strategy. You'll notice I don't give the quantity for any of these ingredients, and that's intentional. This recipe is more eyeball than anything I make and it requires that you taste and taste some more!! The pictures were from a typical week-night meal, rather than for a crowd, but everything scales really easily, so let's get started! I'm going to cover the basics, so skip ahead if you feel like you "get it." Begin by washing and peeling your potatoes. Most of the time I boil my potatoes with skins on, but not these because, particularly at Thanksgiving, I make so many I need to get the peeling out of the way in the morning. Cut out any dark spots with a paring knife.NOTE - and this is critical - Even if you have a disposal, never put potato peels in your drain. It will clog your pipes and you'll spend the day after Thanksgiving waiting on a plumber! I line the sink with a paper towel for easy clean up!Cut the potatoes into roughly even pieces to ensure they all cook at the same pace.Put into a sauce pan where you have 2-3 inches of space above the potatoes. Pour in enough chicken stock to cover the potatoes by an inch. I usually use my homemade stock to reduce the sodium content, but store-bought works just fine! Add whole garlic cloves to the potatoes. I use about 2-3 cloves for every pound of potatoes.At this point you can set the pan aside and make the rest of your meal (the potatoes won't get soft until you heat the stock). For me, the mashed potatoes are the very last thing to be done, so I start the burners about 20-30 minutes before we start to eat (allow more time for large quantities of spuds!). When you're ready, bring the potatoes to a boil over medium high heat.Reduce to simmer and allow to cook until the pieces are easily pierced with a fork. Do NOT OVER COOK! The potatoes shouldn't be falling off your fork when your stab them. I take one piece out on the cutting board and smash with my fork to test for readiness. (You should be able to press through the potatoes easily.) 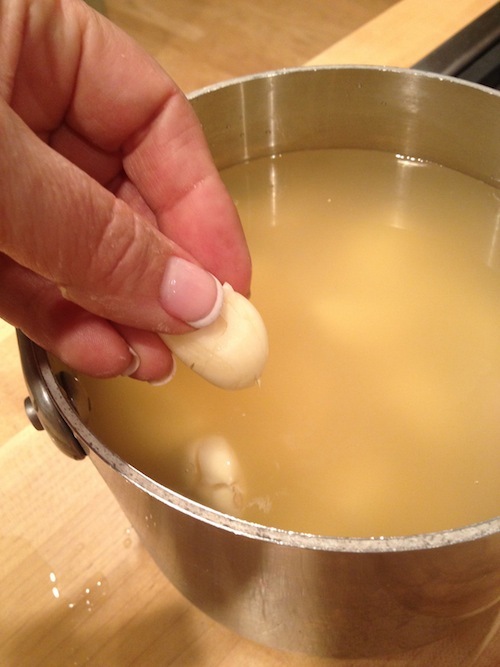 When ready, drain off the stock.Return potatoes and the garlic to the pan and put on low heat for a minute or two to make sure all of the excess liquid evaporates.When you're sure all of the liquid is gone, smash with a fork. Divide your butter into tablespoon sized slices. I use 2-3 Tablespoons per pound of potatoes (BUT you should do it to your taste! )Blend in the butter with a handheld mixer.When the butter is whipped in and you're happy with the flavor, finish off with a little bit of half & half or heavy cream. Yes, you can use milk, but why sell the flavor short? How much is a "little bit"? Maybe a tablespoon for every pound of potatoes? I really don't want you to measure, but watch the potatoes come together. Pour in a little at a time as you whip. You don't want to make a soup, just a finish of richness.Add salt (sea salt is my favorite for this dish, but table salt will be fine. Do NOT use kosher salt!!) and WHITE pepper. White pepper will blend in without leaving black specks. Plus, you can use it the next time you make chowder!When you plate the potatoes either individually or in a bowl, for an extra touch, add a bowl in the middle with a little bit of butter and paprika for contrast. Presto! Best spuds on the block!